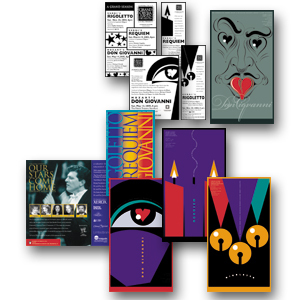 AMA Selects TFI as one of Top Twelve | TFI Envision, Inc.
Hartford, CT – The American Marketing Association selected Tom Fowler, Inc.’s design work on the campaign for the Connecticut Grand Opera & Orchestra 2004-2005 Season, to receive a 2005 Mark of Excellence Award – one of only twelve selected for this honor. The pieces were judged based on strategy, execution and results. Shown at right are some of the small space B&W ads, the brochure cover and sample spread and the posters. This was the first time that Tom Fowler, Inc. entered the AMA show. Needless to say, we are pleased with the results.